We know only too well how frightened animals can become at this time of year with some eight million of our pets now having a firework phobia. Pets exposed to bright flashes and loud noises have no understanding of what’s going on, and this can understandably upset cats, dogs and rabbits of the most relaxed dispositions. Fear or stress can result in negative behaviour such as toileting in the house, refusing to eat, destructiveness, trembling or even attempting to run away. Thankfully there are ways of reducing your pet’s distress and making firework night much more bearable for them. You can buy dedicated CDs of firework noises and, if played regularly to your pet in the weeks leading up to fireworks night, it may help to desensitise them to loud noises. This technique works best for dogs and should be done daily, in short sessions, increasing the volume of the CD slightly each time. Reward your dog with a treat each time they settle or don’t react to the noise. Eventually your dog should remain calm even when the CD is playing at a loud volume. For dogs, you can buy a diffuser, a spray, or a collar that release synthetic versions of the pheromones that a mother would produce to comfort her puppies. For cats, sprays and diffusers are available and work to increase their sense of security. These devices, which generally only work in mild cases of anxiety, should be introduced into your home a week or two before fireworks night. Alternatively, your vet may suggest a tablet form product such as VetPro Stress & Anxiety. Taking your dog for an early walk, well before the fireworks start, should work off any energy or excitement, and make them tired and hopefully calmer. If your rabbit lives in a hutch outdoors then, if possible, bring it indoors or place it in another quieter place, such as a garage. And putting them into their hutch earlier than normal will allow them to settle and feel safer before the fireworks begin. This is as simple as closing all your doors and windows, securing catflaps and closing the curtains. For smaller animals, cover their enclosure with thick blankets or a duvet to dampen the noises from the fireworks. Keeping pets inside while fireworks are going off may sound an obvious tip but it’s vital. Dogs should never be taken to a firework display. Make sure a cat that likes to roam is indoors early and has an easily accessible litter tray, so they won’t want to go outside to relieve themselves. And try not to leave your pets at home alone – just like humans, they often prefer to seek comfort in company when they are scared. For your dog, this may just be their usual bed but they may appreciate an open crate with blankets and a toy inside, or a pile of blankets under a table. Cats usually hide when they are scared, so ensure their favourite hiding place is accessible. Provide extra bedding for your rabbit or guinea pig to burrow into to help them feel safe. These snug-fitting shirts target various pressure points, creating a sensation similar to swaddling a baby, and are available for both dogs and cats. Vets sometimes recommend these shirts as a drug-free option for pets that suffer anxiety and fear of loud noise, hence the name. Our pets readily tune into our moods so be as relaxed as possible. However, if your dog is showing signs of being scared, don’t attempt to comfort them as this teaches them that the noises are actually something to worry about. It is better to praise your dog when they are calm to reward good behaviour. A frightened cat may prefer to be left alone, so don’t try to pick them up or restrain them as this might only increase their stress levels. We always advocate microchipping but it’s even more important at this time of year, and it’s worth checking that all your details are up to date too. Animal shelters are often busier during firework season, and knowing you’ll be able to trace a runaway pet will give you some peace of mind. The TV and radio or some mellow-sounding music can divert your pet’s attention from the noise outside. 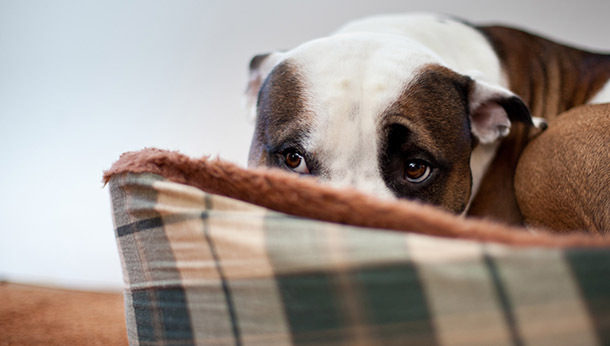 Dim the lights for a cosier atmosphere and, if your dog or cat is still showing signs of mild anxiety, see if you can distract them with a game or offer a few of their favourite treats.